It is great that your acne scars are improving. I do recommend applying the A-Ret right after dermarolling or needling in case of persistent acne scars, other scars or stretch marks and it would be useful for hyperpigmentation as well but the problem is that the A-Ret contains the acidic form of vit. A and if you enhance the absorption by dermarolling, very much is absorbed and the acid causes a burning sensation in the skin. It is not so bad on body skin, especially if you apply it on a small area and you can easily handle applying it into several needled acne scars but applying it to your whole face after dermarolling can be quite painful. I have once applied the A-Ret all over my face before I went to bed, after rolling with a 0.2 dermaroller and I was suffering for hours with my face being on fire. My skin was totally OK the next day but I would not do it again due to the pain. I tried it on my body skin and that was OK. I could certainly handle applying it on a small part of my face so you can try that. Do it after rolling with a 0.5 mm dermaroller. Maybe other people have different experiences and I perceived the pain more due to the fact that it was at night and I wanted to sleep. In any case, try it on a small area first. The treatment of stretch marks and scars (except for acne scars) is the same. It is better to concentrate on a smaller area but do it thoroughly. Stretch marks usually respond to a 1.5 mm dermaroller but sometimes they need a combination of a 1.5 mm roller with more intensive and targeted treatment such as single needling or a 1.5 mm ONE LINE dermaroller and the A-Ret gel. Our single needle is a custom made needle that is about 2 mm long, very strong and thus suitable for repeated needling, it has a long taper in order to facilitate insertion (the skin is very tough protective organ, it is not easy to penetrate it - not even with a sharp needle). Once a month if you do intensive, deep treatment such as single needling and once in three weeks if you do a regular 1.5 mm dermarolling. I know about this method and I was planning to write about it but several customers tried it and corresponded with me about this method and they ended up with quite serious hyperpigmentation that did not disappear. I wanted to think about how to ensure that people will not end up with hyperpigmentation. So far, I have not come across a solution. You can achieve the same results with dermarolling and needling with a much lower risk of infection or hyperpigmentation. What I recommend for stubborn stretch marks is to apply the A-Ret gel immediately after needling into the individual stretch marks. A-Ret contains retinoic acid. It will trigger peeling. BTW, this laser centre stole a photo from the sandpaper/TCA peel study, placed them on their website pretending the stretch marks improved due to laser treatment! Acne is more or less caused by excessive sebum production and blocked pores. Keeping pores clean should help reducing acne but once acne forms, it is not very likely that the oil method would help reducing existing acne. When you are acne-prone, make sure that all the oil used during the oil cleansing method is removed from your face when you finish. If the liposuction was five months ago then it is OK to use a dermaroller on the area, in spite of the remaining stains. You should definitely apply a sunscreen to it because exposing a fresh scar to the sun without a sunscreen could cause hyperpigmentaation. I have heard about silicon sheets being used for hypertrophic scars or to prevent hypertrophic scar formation but I have never heard it would help any kind of pigmentation. Dermarolling / Microneedling / Derma stamp and Derma roller together? Yes you can use the dermastamp on all of your areas at the same time, however a dermastamp is more intended for treating localized scars. There is absolutely no reason why not to use it elsewhere but since it has only 35 needles, using it on large areas will make it blunt much sooner than using it on the scars only and you will have to buy a new one. Be very careful about using it on your nose. Do a small test patch first and never do any intensive, aggressive procedures on your nose. Nose skin is different from other skin and it heals unpredictably - you may end up with worse skin there then you started with. Either use a dermaroller for everything and replace it more frequently or buy a 1 mm dermaroller. I use almond oil to clean and moisturize my skin. I slightly wet a cotton pad with tap water, add almond oil and clean my face. Almond oil will keep the skin moist and supple by preventing evaporation of water from the skin. I also apply almond oil on my body skin (while the skin is still wet) after a bath. I keep a bottle of almond oil in the fridge and refill a small container that I keep in the bathroom. From time to time a use fine salt in the shower for exfoliation. I use Infadolan around my eyes and on top of my hands. I use the A-Ret gel twice a week and the homemade vit. C serum three times a week but I have to admit I have been slacking on it and did not apply it as frequently. When my skin is irritated I apply a cream with pantothenic acid. I use a sunscreen on my face with micronized zinc oxide. I do not think that this skin routine is good for every skin type or totally sufficient in general. Neither it is possible for me to answer questions regarding efficacy of various creams. I cannot do the efficacy evaluation of any creams. It has to be done by unbias clinical trials (if at all). You have to experiment to find out what suits your skin. Just remember that often the only difference between a cream that costs 100 dollars and 10 dollars is 90 dollars and for the rest there is no difference in their efficacy in spite of all kinds of hype sounding ingredients in the expensive cream. Also the more is not always the better. Do not use peelings or exfoliation excessively - do not clean the skin excessively. The skin has natural oils that keep it moist and protected. Yes you can do the Glycolic peel and you can use a dermaroller as soon as the acid peeling is healed. Hemosiderin stains appear after bleeding and they will disappear by themselves when the skin trauma from liposuction is completely healed. Dermarolling will not make the stain worse but do not use a dermaroller until everything is completely healed and the stains are gone. Skin routine suggestion (you do not have to use all the suggested skin products. Modify it as much as you want and use products of your choice). Thursday: Infadolan around the eyes and your daily cream on the face in the morning. In the evening: dermarolling with a 0.2 mm dermaroller, apply vit. C immediately after. Once a month: Vit. C for three consecutive days, dermarolling with a 1.5 mm dermaroller, Infadolan right after dermarolling and a couple of days more (if it doesn’t make you break out). Use both the 0.2 mm and the 1.5 mm on your face, around your eyes, on your hypopigmentation. Use the 1.5 on your stretch marks and on the scars on your calves. 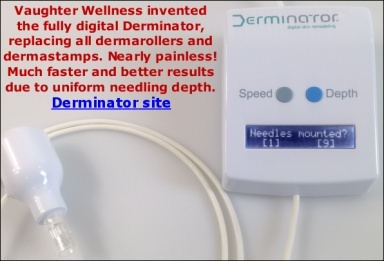 If you do not manage to break up the hardened scar tissue on your calves with a dermaroller, buy the single needles. If you want to buy only one dermroller, buy a 1.5 mm or a 1 mm roller. There is no need to roll the entire face in one go - it is better to roll smaller areas but properly. It is also easier to handle the pain if you roll only a part of your face in one go. Definitely do not force the Fixomull off, wait for it to fall off by itself. If you soak Fixomull with water or oil, it will facilitate its gentle removal but never force it off since premature removal of the scab can cause scarring. The regenerative ability of a child's skin is amazing since the turnover of their skin is very rapid and they seldom end up with permanent scars. Even if there is a small scar after Fixomull removal, the scar will most likely disappear. This can take several months. The only way to find out how your skin will react and how long it will take to heal is to roll, stamp or needle a small area of skin - a test patch.